Asphalt striping and parking lot stenciling aren't something you do only once and forget about. Particularly if you want your parking lot to be safe and compliant with local ADA regulation. Does having a safe parking lot worry you? How about a potential fine for lack of "visible parking lot lines?" You'll notice over time that mother nature's elements and sunlight will make even the best painted lines fade with the passage of time, did you notice your potential for a lawsuit increased as well? Fortunately, ADA Compliance companies are around, and ADA Striping services to help mitigate your risk for any issues. Fresh paint is important – don't be fooled. The moment your parking lot stripes fade, is the moment your commercial property could be potentially facing an ADA lawsuit. Meaning, if a disabled person enters your parking lot – and does not see the lines for handicap parking, proper signage, or appropriate pathways, your company could be facing upwards of $5,000 – $10,000 per lack of handicap access. The appearance of your lines are due combination of their colors and the kinds of paints you choose. Yellow is a traditional choice for stripes, but blue is growing in popularity and used for ADA Compliance specifically, red is for fire-access points. In many cases, this all boils down to individual requirements per your location and city. What is important, is to remember that particular stencils, like those for handicapped spaces, have specific legal requirements in terms of shape, size, and color and must be applied on a regular basis to make sure you aren't facing a potential ADA lawsuit. Many laws and regulations will require blue with white or yellow for painting the handicap symbols needed for accessible spaces. Solvent- and water-based paints are the two kinds typically used for paint striping in parking lots. In either case, they need to be formulated specifically as a traffic paint intended for paint striping a parking lot. Latex paints and acrylics just aren't going to adhere to pavement. They can peel away quickly before your planning and hard work all get washed away. If you want the best in terms of visibility, then add reflective beads to your freshly painted lines. They can be particularly useful in any areas with ice, snow, or night traffic. That's because car headlights will light up the reflective beads, so things are a lot more visible than just paint alone. They big thing with beads is that they need to be added to a parking lot that is freshly striped if they are going to stick. You can likely guess that applying these manually isn't as fast, efficient, or professional in appearance as can happen when you use modern equipment. Some machines have an option for adding on an automated bead dispenser, but not always, so check. Think it over. The application of sealer physically blacks out all of your paint lines, meaning that they need to get repainted. Sealing every other year is a critical element of asphalt maintenance, and as such, line striping has to happen every other year too. A blacktop that is freshly sealed is going to look amazing of course, but topping it off with fresh paint and striping should make it look downright stunning. This is wonderful news for all businesses and buildings, be they malls, schools, houses of worship, or shopping malls. Making a parking lot look well-designed and maintained is easy to sell others on and get done. Property managers looking to save their money could easily learn to do work like this with their own resources and staff. 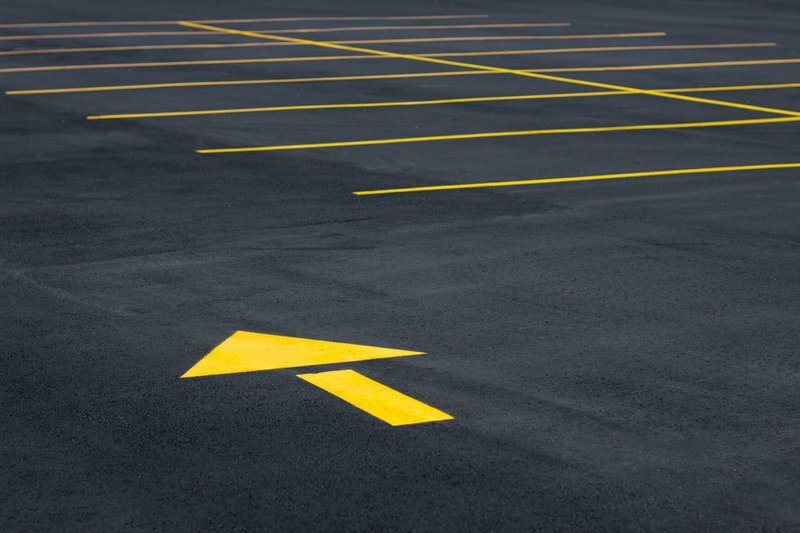 Sealcoating businesses discover an entire new class of potential clientele when they put parking lot striping onto their service list. If you're serious about doing line painting, then you can pick from a broad variety of striping equipment to find the one that best suits your needs. Don't hesitate to call us, because we want to help you out! After all, your success determines our success, and so we'll be sure you get all the information that you require. How Often Should You Restripe? Now you're wondering how often you should restripe your parking lot? As often as possible. At least 1x per year. The two factors that decide this are traffic and climate. Do you get buried under snow each year? Snowplows typically scrape up quite a bit line paint when they take up snow and ice. That means a spring repainting is typically a must. Also, given that regular sealcoating can prove a crucial element of keeping up the integrity of your current asphalt, then you need to repaint each time the sealant blacks out any line markings. Your best-case scenario is doing this once every other year, or possibly every three years.